By Chris Williams on August 8, 2013. We’re already thinking about going back to school, so it’s not too early to think about fall-invading pests. By that, we mean those insects and other pests that try to get into our homes when the weather turns cooler. The insects know, through changes in temperature and day length, that their time is almost up. For some insects, that means that they will die by the time of the first hard frost, leaving behind eggs, or immature insects, or fertilized queens that will carry on come spring. Many insects, though, “overwinter” and become active once again in the spring. This means that in late summer/early fall these insects begin looking for sheltered places to spend the winter. In most cases, those sheltered places are in leaf or litter piles, in mulch, under tree bark, in stumps or in woodpiles, under boards, logs, or stones—anyplace that offers some protection from the elements. Here, the insects don’t exactly hibernate but they slow down their body functions, stop feeding, and become inactive. But since the insects are seeking warmth and they’re not picky, some of them will end up in our homes for the winter. Most of the insects that invade homes in large numbers are those that are associated with various plants and crops during the summer. If you live near orchards or fields, you may be more likely to be visited by stink bugs or Asian lady beetles. If you have certain trees near your home, you could see elm leaf beetles, boxelder bugs, or western conifer seed bugs. Other pests that move in as the weather cools include camel crickets, cluster flies, and wasp queens. Mice also invade homes in the fall—but that’s another blog. Whether you will play host to fall invaders depends on location and on how susceptible your home is to invasion. If you have spaces around doors or pipes or lines that enter your home, or if there are openings around your roof line, insects can find their way in. 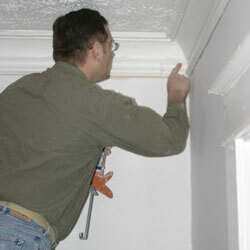 Many insects end up in the attic but can move into living spaces once inside. Now is the time to seal, screen, and caulk.